Hello Bookworms! As an ageing sports jock I felt compelled to open with such a line. I write this guest blog with a heavy heart. I was invited to be my partner’s first ever guest blogger a few weeks ago. You can imagine my shock and disappointment to find that without prior notice, my guest spot had been given to another, and to compound my ever enlarging sense of loss, I was passed over for one of her bookworm friends. The politics! The injustice! Ohhhhhh… how the heart aches! I love books, always have. I have particular affection for old books. The covers fascinate me. I love the colours, the textures, and the sense of history that overwhelms you when you hold one in your hands. But most of all, I love the way they smell. Yes, I am that strange man you will find at the back of the second hand book store sniffing the books. Forget it, your disapproving glares will never stop me! My problem has never been a lack of passion for books, it has been more the fact that I like to look at them, touch them (smell them) but not read them. How strange it is to find myself waking every morning next to a pure academic and one of the most disciplined book readers I have ever met. Who the hell gets out of bed at 5.30am every day to read a book? Normal people go for a run, ride a bike, drink coffee, or read the paper to start their day. Over the last three years, my partner has made numerous attempts to have me read a book, with little or no success. Three weeks ago, after much prodding, I finally relented and agreed to read a book that she assured me I would love. 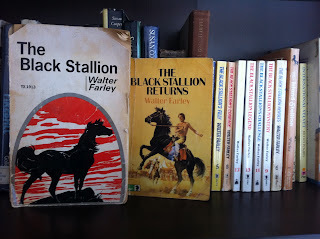 She handed me a copy of The Black Stallion, by Walter Farley. I looked at her confused. This was a children’s book. I am very much at home in the boardrooms of multi-national companies, and she hands me a children’s book? Should I be offended? She ever so lovingly explained that I was on my bookworm ‘L’ plates. This wasn’t ‘L’ plates…this was training wheels! Sitting in my office, about to open my first email for the day I decided to read the first page. This quickly led to the second, third, fourth and many more. I was hooked. It was like a drug. I couldn’t stop. Oh, I tried to give it up. I tried to answer emails. I tried to return phone calls. I tried to be the responsible businessman the world believes I am. I couldn’t do it, I simply couldn’t. I realised I truly had a serious book problem when I cancelled an afternoon meeting just so I could continue with the book. I had to know what happened next. I just had to! Is there an outreach programme for book junkies? Later that afternoon, I was finished. I sat quietly at my desk reflecting over the magical journey I had been on. You could tell this book had been written some time ago, in an era where society was far more refined and elegant than it is today. At face value, a book about a boy and his horse appears to be such a simple story. What Walter Farley offers is an invaluable piece of social commentary. My only regret was that it had to end. What now? There must be a God! 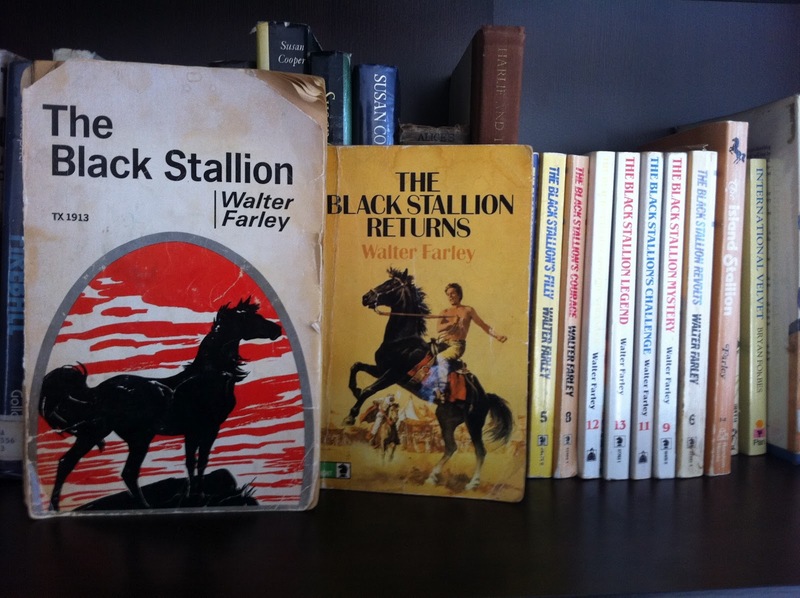 Apparently there was a sequel with the completely original and unexpected title of…The Black Stallion Returns. This book is just as captivating and exciting as the first, although, it did take me three days to finish. Unfortunately I had to do some work. Pesky clients. All I can say is, embrace your inner child (for me that’s not too hard), throw away your inhibitions and run naked through a field, climb a tree, build a sand castle or perhaps…simply sit down and read these two gorgeous books with a lovely glass of red wine. I can’t express in words what a wonderful experience I have had. I would like to thank my beautiful bookworm blogger for the brief interlude into her unique world. I will continue to read, strictly from the children’s section of her bookcases of course. Above all, I will continue trying to come to terms with the fact that I will forever be her second choice guest blogger. This will be a struggle, although a very large home made apple pie with my favourite vanilla bean ice cream may help ease the pain…just a little. I agree! There is nothing like a book on hard copy...being able to look at, touch, and (you're right!) smell it! I am a big fan of the positive impact digital msmedia has on our lives, but it saddens me that it also seems to be causing the decline of the bookstores in my local area. It is a rare gem of a shop that dedicates itself to real, physical books in Adelaide these days! E-reader certainly have their place, but there is a physical sensation to the act of reading a book that e-readers lack...give me a real book whose pages I can leaf through any day, thank you! Thanks for your comment - DB will be thrilled to bits! Ah, yes, women are like that, aren't they? Still, I don't want to minimize your pain, but when she starts... oh, never mind. I don't care for horse stories myself, but I totally get the thrall of the childrens' book. In the hands of a skilled writer, they can take you back to your first crush, your first adventure, your first... well, anything. Ask that brilliant woman you hang out with to turn you on to some YA. 12 to 16 was a good age, at least for me. Young enough to be irresponsible, old enough to be out and about without holding mommy's hand. Or, if you a fancy a rip-snorting good adventure, have her direct you to Beyond the Rails. Comes in a handy, bite-sized format to boot (like the way I got that in there, Kaz? Subtle enough? Now you know why my nickname is Hammer...). The point is, find something that transports you, and inhale it. I haven't been able to find the source of this quote, but it's brilliant: "I always feel sorry for those who don't read; they only get to live one life!" Welcome to the adventure, my friend! You should maybe try these particular horse stories - there's a vintage quality to them that I suspect you might rather like. Comment has been communicated to the writer, along with the information that there will be a printed copy of the first installment of Beyond the Rails for him to read if he wishes, after I've finished with it myself! Great guest blog - DB. You don't know me, but I know (of) you through our mutual friend. Glad to hear how much you enjoyed your reading of "The black stallion" - may this be the beginning of the rest of you reading life!! (Like Karen I'm a self-confessed book-lover. Great to see you on the blog - and many thanks for posting so many fabulous images to steal!! !